In recent years, South Korea has been one of Boeing’s top markets, with revenues almost equally split between Commercial Airplanes and Defense, Space & Security. 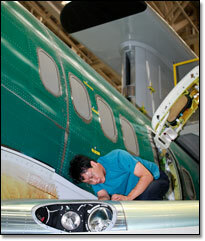 Boeing’s annual online Health Assessment is available from late October until Dec. 23. This is an opportunity for employees and spouses, or their eligible domestic partners, to find out just how healthy they are -- and to identify risks. Finding out about possible health risks early helps prevent serious conditions from developing later.